Internationally renowned Birmingham artist Reuben Colley has presented one of his latest paintings - featuring an iconic inner city location - to a local businessman. Kevin Patrick Sharkey, from Sutton Coldfield, commissioned the artist to produce a painting of the area in and around Dartmouth Circus in Aston. Reuben chose the Pump Island at the A38 Aston Expressway – a view familiar to millions of motorists as they enter Birmingham city centre from the M6. He picked the location as it is where he has operated his business on Hubert Street, Aston, for the last 15 years, until his recent move into new offices in Birmingham city centre. The James Watt-designed steam engines were one of the driving forces of the Industrial Revolution. They were developed by the Scottish engineer in collaboration with Birmingham industrialist Matthew Boulton. Boulton and Watt were major producers of steam engines in the 19thcentury. The engine at Pump Island, Dartmouth Circus, was formerly used at an ironworks in Netherton in the Black Country. Kevin’s request led to Reuben creating four more oil on canvas images of the area, including Aston Road, The Albion at Aston, Aston House and Aston Brook St. East. They were featured at a major exhibition at Birmingham Museum and Art Gallery. Property developer and investor Kevin said: “I’ve been a fan of Reuben’s work for a long time and I’ve got a small collection of his work at home. I commissioned Reuben to create local iconic image and one that Birmingham people will recognise immediately. Reuben’s paintings are in demand from collectors around the world. He has his own gallery, Reuben Colley Fine Arts, in Colmore Row, Birmingham. He has had a number of sell-out exhibitions in London and Birmingham and his work appears in a number of public collections, including Birmingham Museum and Art Gallery. Reuben said: “The Pump Island, as us Brummies know it, seemed an obvious choice of subject for the Key Land Capital commission. It has, for me, an almost iconic status standing in the middle of Dartmouth Circus, and is very representative of our city’s industrial past. 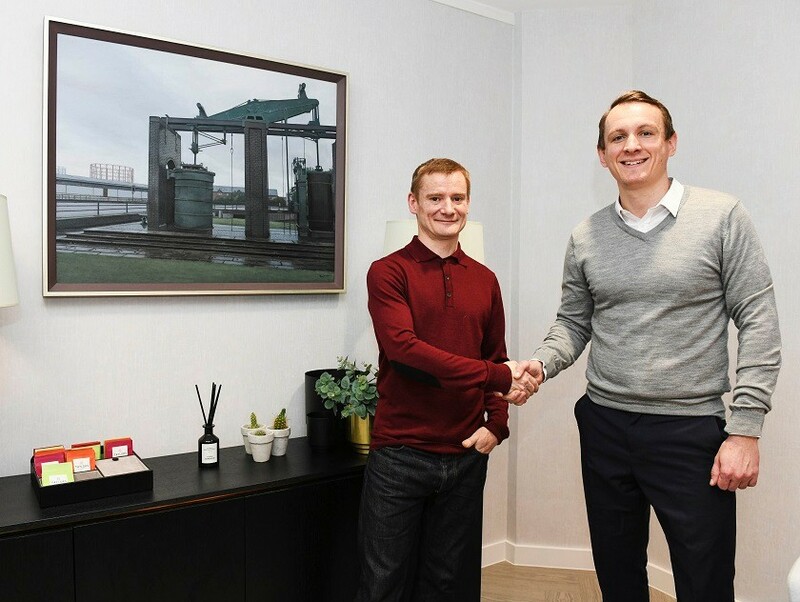 Pictured: Artist Reuben Colley presents his latest work to Birmingham property developer Kevin Patrick Sharkey.